Loan refinancing is simply taking out a new mortgage loan product with the same or different lender, to replace your current mortgage loan product for a more competitive interest rate, better loan product, lifestyle, wealth creation or to consolidate a few loans. It’s a good idea to review your home or investment loan product every two to three years and compare it with other lenders products on the market, to ensure your loan facility is still appropriate for your lifestyle and financial requirements. 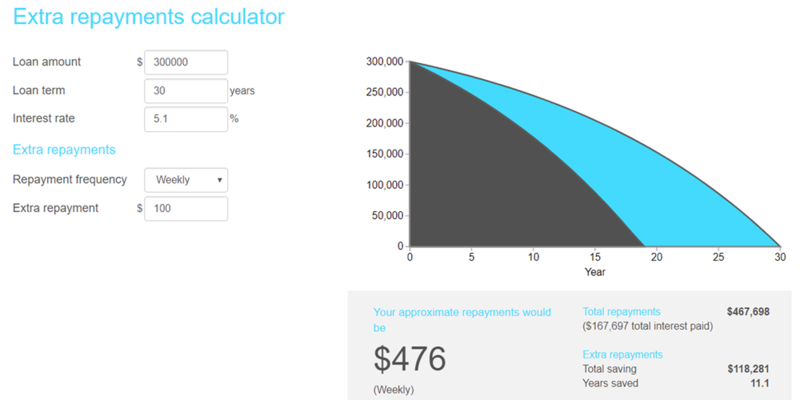 On the Neomoney calculator web page, look for the Extra Loan Repayment Calculator to view what happens when you add into the Extra Repayment Field $50 to $100 which will change the interest payments and show the savings on interest saved plus the loan tern reduced from 30 years. By contributing extra funds into your loan each month can possibly save you thousands of dollars over the life of a loan or a number of loans. + Consolidation of finances e.g., consolidation or combining the credit card, personal loan, car loan & property loan into one manageable facility. + Consolidation or combining loans effectively reduces your loan interest rate and increases the amount of money available at the end of the month. 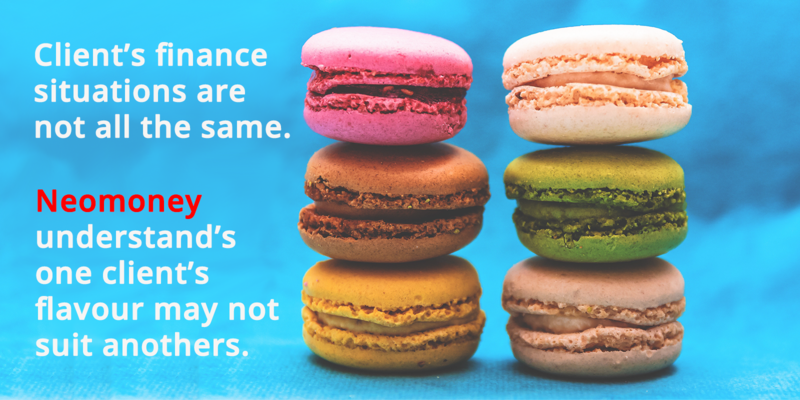 + A bad experience with your current lender may cause you to refinance, and there are much more reasons why. You might be exiting from a fixed rate loan and the switch to your current lenders variable rate loan is at a much higher interest rate, so therefore it maybe a good opportunity to reassess or move to a more competitive interest rate loan facility, product, professional loan or that you just need to refinance to obtain the equity within your property to purchase an investment property or to purchase a new residential home to improve your lifestyle and turn the existing property into the investment property to build your property empire creating long-term wealth with equity within these investment properties. Neomoney clients, get to receive comprehensive product reports which enable them to compare lender against lender, product against product, rates against rates, and lots more types of reports and information to assist with their financial desition making. Once we have made our reasonable inquiries into your financial situation, personal requirements and objectives, we can generate customised reports to assist in your final credit decision that would be not unsuitable to your financial requirements. With these report you are able to make more accurate decisions, finance plans, financial objectives and spending plans (budgeting) to create your long-term financial wealth, financial security, lifestyle and freedom plans. Need Cash Out With Refinancing? Lenders are restricting the amount of cash out or re-draw on equity when a customer refinances a home or investment loan. With a few lenders, you are able to access up to 90% of the property value as cash out to use for future investment purposes. If your lender has restricted the amount of cash you are able to take out from your own property then you need to talk to us at Neomoney. What Other Costs May I Incur With Refinancing? + Discharge & Registration of Mortgage Fee. Be careful of low Intro or Honeymoon Interest rate loans, once loan reverts to the Standard Variable Rate product, it may be higher than a normal discount rate loan on offer. Also check the exit costs of these products, as most of the establishing fees are Zero entry fees to entice you into the product and sting you when you exit. Stamp Duty on a mortgage has long gone, however, you will need to pay the Purchase Stamp Duty on a purchase. Follow this link to the Property Fees Calculator to bring up the Purchase Stamp Duty Calculator towards the bottom of the calculator page to work out the government fees associated with a purchase or refinance. The day both lenders come together to exchange cheques and documents. Prior to settlement day, the new incoming lender will contact your current outgoing lender and the new incoming lender will arrange to book in a settlement date to exchange documents for the mortgage to be transferred. On settlement day cheques and monies will exchange via their own settling agents for the refinance settlement transfer. Once the settlement has occurred, your new lender will normally confirm in writing by posting out a welcome letter or pack to advise of your new home loan account details & lender product features. Allow one week to receive your welcome letter or pack for all your new account details.